I’m totally smitten with today’s wedding in Annapolis, a vintage-inspired affair from Steven Michael Photography. Sarah and Lionel were married in a beautiful outdoor ceremony last year, and I love that they chose a public park as their wedding venue! From Sarah’s vintage dress (made by her grandmother!) to a Swiss candy buffet to honor Lionel’s home country, this wedding is incredibly sweet in every sense of the word. From Sarah: I wanted the wedding to feel fun but sophisticated. 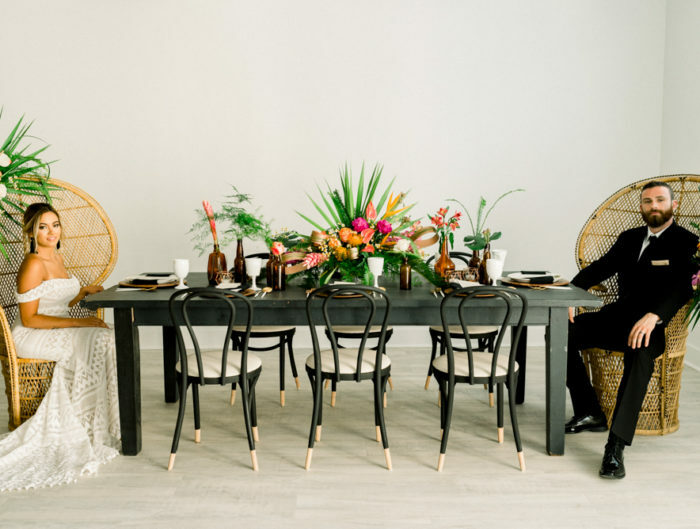 The two words I said that I wanted to describe the style of the wedding were bold and sassy. That translated into a color palette of different shades of red, and I had to have fuchsia. I love the fact that I wore my mother’s wedding dress, originally made by my grandmother. A 30 year-old gown was brought back to life and they were both so happy to see me wearing it. When I first tried it on and it fit perfectly, I knew it was meant to be. From that point on I had a lot of fun completing a vintage look that complemented the dress. As my husband is Swiss, I also felt that meringues had a sort of European feel so I found a wedding cake that I liked and covered it with meringues. I also used gold meringues as the place card holders. We were so fortunate that my husband’s friends and family were able to make the trip from Switzerland and be there with us. It was such an incredible feeling to have both of our worlds finally together in one place. And to top it off everyone got along fabulously! A special moment that sticks out in my mind though is our first dance. We danced to Let’s Never Stop Falling in Love by Pink Martini and it was at this moment where I truly felt like a million bucks. In the spirit of making our wedding fun and memorable, we added several touches to our reception, like having a candy buffet with Swiss chocolates and another Swiss candy, as well as a photo booth with costumes and props. Also, instead of having a guest book we created little booklets with a question about us on the cover that we placed on each table. It’s something we love reading again from time to time. 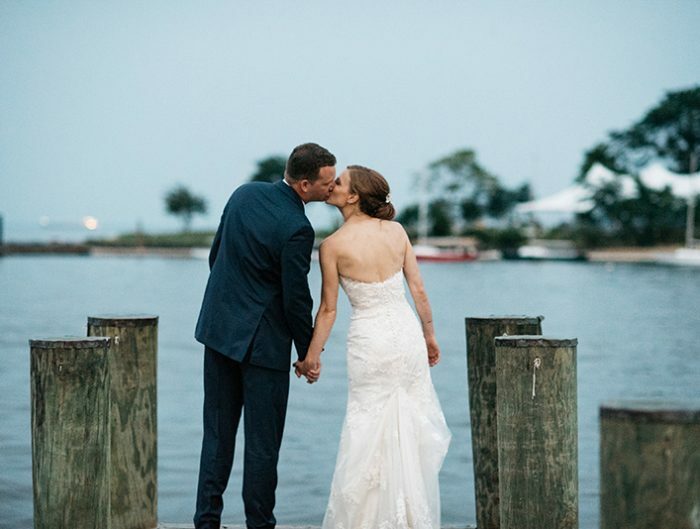 Don’t forget to visit our vendor guide for more fabulous Maryland wedding professionals or our real wedding gallery for more beautiful weddings! what an heirloom! Wearing her mother’s wedding dress made by her grandmother! So memorable and classy!